I'm back from a great family vacation to southern California, where among my favorite gluten-free finds were a donut shop in Los Angeles and a pan-Asian restaurant in Santa Monica serving dumplings. 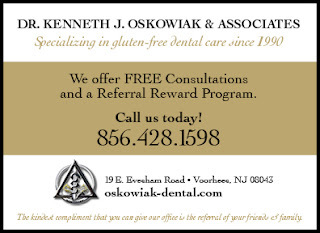 With a couple of exceptions (and a bit of research), it was extremely easy to find gluten-free options. I'll be writing about the trip in an future "Road Trip" post. I attended Tuesday's Phillies game at Citizens Bank Park and got a first-hand look at the dramatic improvements that Aramark has made since the Celiac Awareness night last month. Various concession stands clearly advertise gluten-free options and there's increased signage throughout the ballpark. I sampled a terrific gluten-free cheesesteak that was at least a foot long and overflowed with meat. If all goes according to plan, there'll be a dedicated gluten-free concession stand next season. Out in Reading, the menu at Jimmie Kramer's Peanut Bar Restaurant (332 Penn St., 610-376-8500) notes gluten-free and gluten-free-available options, including chicken tenders and pizza. The restaurant's new executive chef is Andrea Heinly, who appeared on Season 5 of Fox's Hell's Kitchen cooking competition show. The Berks County Gluten-Free Meetup Group is planning dinner there on Thursday, August 30. Gluten-free sandwiches at Center City's Brodo (31 S. 18th St., 215-977-7766), which is now GREAT-trained, can be made with Taffets bread. Many soups and salads are also options there. Brodo will be participating in Appetite for Awareness next month. I posted a review of Rex 1516 on Tuesday. The South Street newcomer has house-baked gluten-free burger buns and a sinful a la mode dessert. Fresh gluten-free bagels are no longer a dream - at least in the Delaware Valley. 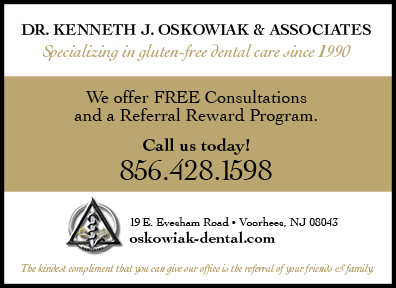 Michelle MacDonald's Gluten Free Bagel has plain, everything, sesame, poppy and cinnamon raisin varieties available at Redhouse Bagels in Bensalem (1542 Bristol Pike, 215-244-0776) and at all Green Line Cafe locations in West Philadelphia (4239 Baltimore Ave., 215-222-3431; 4426 Locust St., 215-222-0799; 3649 Lancaster Ave., 215-382-2143). While the bagels are made in a shared facility, MacDonald uses dedicated racks and baking sheets. The gluten-free bagels are prepped in a separate area and aren't made at the same time as wheat versions. Best bet is to call ahead to confirm availability and to place large orders. On tap this weekend at Beer Cakes Philly (517 S. 5th St., 267-940-7264): Gluten-free strawberry cupcakes made with Dogfish Head's Tweason'ale. Owner Lexi Malmros bakes these separately from her other wares, and she's looking to expand the gluten-free line. Six Flags Great Adventure in Jackson, New Jersey (1 Six Flags Blvd., 732-928-1821) has finally made gluten-free food available at the park. Gluten-free (and also gluten-free/dairy-free) pizza, brownies and blueberry muffins are sold at the Main Street Pub, while fresh fruit can be found there and at Granny's Chicken and Ichiban's Tea House. The salads at Best of the West and Granny's Chicken are also safe. Great Adventure is open daily through September 3, then weekends in the fall. New from Kozy Shack is a line of "Soda Shoppe" puddings. The first two flavors released are Orange Cream Pop and Root Beer Float. If you're interested in gluten-free cooking, there are several upcoming classes in the area. Check out the Events page at the blog for more information. I'm planning to take next week off, with posts to resume after Labor Day. I'm always active on Twitter and Facebook, though, so be sure to follow me there. Have a great weekend! After weeks of traversing the highlands, the king has returned to his castle. Yes, our older son is home after six weeks of sleepaway camp in the Poconos. Since he hadn't been to a restaurant in over a month, I decided to take him out to lunch in Philadelphia after picking him up from the drop-off on the Main Line. He bit when I suggested brunch at Rex 1516 (1516 South St., 267-319-1366). The restaurant's menus are inspired by Chef Regis Jansen's origins. The Alabama native often uses Southern-style ingredients such as Andouille sausage, okra and grits in his dishes. The blackened shrimp and cheesy grits dish on the gluten-free brunch menu was intriguing, but we both opted for the more traditional hamburger. The 8-ounce patty was served on a warm, house-made gluten-free bun that largely stayed intact with each bite. Sandwiched between meat and bread was a sweet onion marmalade, a few half-strips of bacon, and a dollop of pungent blue cheese. We passed on the fries since the fryer had been used earlier in the day for wheat items, but the kitchen prepared a bright side salad. As good as the burger was, the highlight, prepared by pastry chef Shamus Moriarty, was the King’s Gateau. The flourless chocolate cake, plated on a puddle of chocolate sauce, was enrobed with a peanut butter mousse and topped with a scoop of banana ice cream and homemade peanut brittle. The bar has a selection of wines, cocktails and - currently - two hard ciders: Ace Apple Cider and Angry Orchard Ginger Apple Cider. Since there won't be playoff baseball in town for the first time in years, the focus this fall will be on the Eagles. The regular season kicks off September 9 with the Birds in Cleveland, with the first home game scheduled for the following Sunday. Aramark will once again have gluten-free fare at Lincoln Financial Field: hot dogs, Larabars and Redbridge beer are available at the "Philly Favorites" stands at sections 117, 205 and 219, and gluten-free Crabfries are sold at the Chickie's & Pete's locations at sections 102, 119, 229 and 241. Fans can also bring their own food to the game so long as it's wrapped in clear plastic. 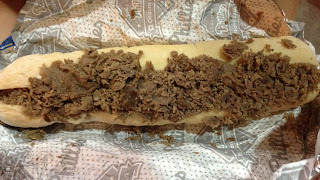 Despite the Phillies' woes this season, there are other reasons to go to Citizens Bank Park. Gluten-free cheesesteaks are now available at Elfreth's Alley Grill at Section 109, and Bull's BBQ in Ashburn Alley has gluten-free rolls. This complements the pizza recently added at Season Pizza in the Alley. Kudos to Aramark for stepping up its game. Old City's Panorama Ristorante, nestled in the Penn's View Hotel (Front & Market Sts., 215-922-7800), now offers gluten-free pasta. The restaurant holds the Guinness world record for the largest cruvinet, or wine preservation and dispensing system (120 bottles). The all-vegan Vgë Café (say it "vee-gee") in Bryn Mawr (845 Lancaster Ave., 610-527-3091) has gluten-free mac & cheese, soups and salads. In Margate, the Mediterranean restaurant Sofia (9314 Amherst Ave., 609-822-9111) notes gluten-free entrees, including crabcakes, with an asterisk on the dinner menu. Many of the appetizers and salads are also safe. Elsewhere down the shore, the gluten-free menu at Alumni Grill in Wildwood (3316 Pacific Ave., 609-523-1111) includes burgers and sandwiches on rolls and fries. Gone from Center City is Buca di Beppo. The Italian chain's locations in Exton, Wynnewood and Wyomissing remain open. 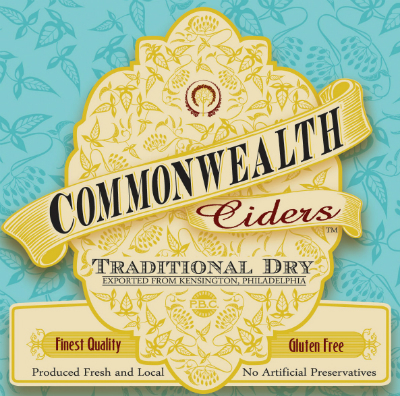 As mentioned here two weeks ago, Philadelphia Brewing Co. has released a new gluten-free hard cider. 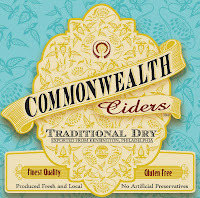 The Traditional Dry cider is now available on tap at Atlantis the Lost Bar in Kensington, McGillin's in Midtown Village and Cherry Street Tavern in Logan Square. It'll be available in bottles in the fall. 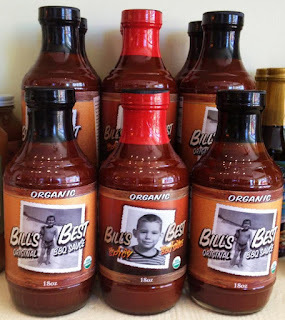 As mentioned here on Tuesday, locally made Bill's Best Organic BBQ Sauces are free of gluten (of course) as well as the dreaded high-fructose corn syrup. The Ravitz ShopRite markets in Cherry Hill, Marlton and Mt. Laurel now stock Butterfly Bakery's gluten-free blueberry mini muffins, sliced creme cakes and other baked goods. The company's gluten-free products, made with teff flour, are produced in a separate facility. Reader Rose B. let me know that Dogfish Head's Tweason'ale is on the current bottled beer list at Keg & Kitchen in Westmont (90 Haddon Ave., 856-833-9800). Voting continues for "Best Local Blogger" on PHL17's Philly Hot List. Please show your support by voting for the blog at this link. Finally this week, best wishes to hometown gluten-free chef Monica Glass, who is leaving our fair city for a executive pastry chef position in Boston. The Montesini Pizza location in Marlton (221-A Greentree Rd., 856-988-8899) has gluten-free pizza. The pies are baked in a separate oven and all ingredients are pulled "from the back" to avoid cross-contamination. A hat tip to reader Heather S., who let me know that Veekoo Asian Cuisine in Royersford (333 10th Ave., 610-948-5433) keeps gluten-free soy sauce on hand for noodle dishes and sushi. Gluten-free gnocchi lasagna is on the summer menu at The Quick Fixx on South Street (1511 South St., 267-273-1066). Thanks to Kristin D. for the news. La Campagne, the GREAT Kitchens-trained French BYOB on Kresson Road in Cherry Hill, has closed. Also shuttered is the last area Bensi location in Sicklerville. The regional Italian chain, which served gluten-free pasta, previously closed spots in North Wales and Wyomissing, Pennsylvania and Hamilton, New Jersey. Although not in the Delaware Valley, Harrisburg is close enough that the opening of a new gluten-free bakery in that area warrants a mention. Betsy's Bakery in nearby Camp Hill (115 St. John's Church Rd., 717-730-9900) will open one week from tomorrow, with cookies, brownies, cupcakes, pies and other sweets (some vegan) on the menu. Glutino has introduced a new line of snack crackers, starting with Sea Salt and Rosemary & Olive Oil flavors. The crackers are made with rice flour. You can print a Glutino product coupon from the company's website. I'm pretty sure it wasn't Congress who declared yesterday IPA Day, but perhaps you celebrated with a gluten-free beer. As I wrote on Tuesday, the newest gluten-free brew is an American-style India Pale Ale from Steadfast Beer Co.
A reader was kind enough to nominate Gluten Free Philly in the "Best Local Blogger" on PHL17's Philly Hot List. Please show your support by voting for the blog at this link. Voting is open until Friday, September 7. Don't forget that gluten-free pizza will be available at Phillies games beginning tonight at the Seasons Pizza stand in Ashburn Alley. My new Delaware Dining Guide is available as an e-book download. Featured in The News Journal, the guide provides hyperlinked listings for restaurants, bakeries, markets and attractions throughout the First State, including Wilmington, Newark and the southern resort towns like Rehoboth Beach and Dewey Beach. Updated editions published within 30 days of initial purchase will be emailed to purchasers free of charge.